Ok, so I had fun making these! I had some choritzo mix left over and had made some pasta dough for fettuccine so I thought I would make ravioli. 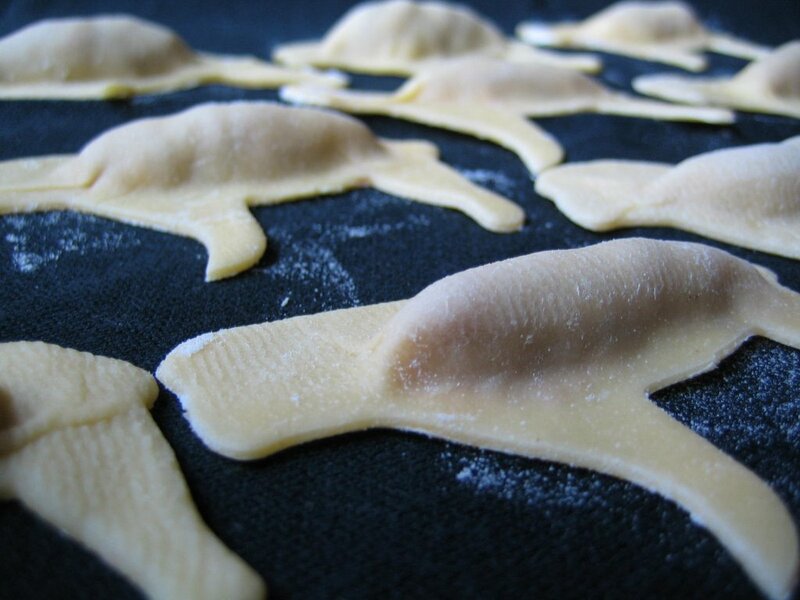 And since pigs were on my mind I decided to make pig shaped (well, they could be pigs, sheep or pug dogs) ravioli. Totally amused me, it was like putting the guts back in! Make some pasta dough using a ratio of 100g of durum wheat flour to 1 egg and a pinch of salt. Leave to rest for 1 hour in the fridge. Roll out as thinly as possible, or to the smallest setting on a pasta machine. Lay the pasta on a floured surface. Allow more for the cover layer than you have for the bottom. Make some sausage shapes with the filling and lay out on the pasta, ensuring these will fit inside the cutter you choose with room to seal. Paint the pasta with lightly beaten egg white so the cover layer will stick. 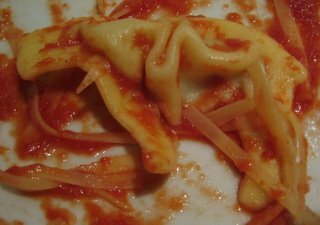 Cover with another layer of pasta, pressing out any air and pressing the two layers together. Cut into your chosen shape. Leave to dry on a floured tea towel while you make the sauce. Simmer a can of whole peeled tomatoes with some garlic, dried chilli, oregano and thyme until it is thick and the excess water has evaporated. Push through a sieve and discard the herb stems, chilli carcass and tomato seeds. Season with salt and pepper and reheat. Cook the ravioli in lots of salted boiling water until they float to the top and look cooked. Looking at this now I think it definately is dog shaped - Dog-shaped Durum-wheat dough - Perfect for Slashfood's D-Day! So funny! Love those Dog looking ravioli!!! Good job! Hey what an awesome idea! My guess is they're Dachshunds too, right? hehehe lotsa fun! Ha ha! Yes - sausage dogs - of course! The sausage dogs are hilarious! Love it! Hot dog! LOL.